If you have children in school: preschool to high school or anywhere in between, you know there is a tremendous amount of paper that comes into your house. Some papers require action, some are sentimental keepsakes, and others can make their way to the recycle bin. 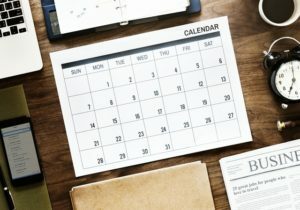 Here are some ideas on keeping track of all these papers before you become overwhelmed (or fixing the problem if you are already overwhelmed). A system to deal with papers when they enter your home is the beginning of an organized paper management system. Upon entry into your home, papers need a place to go otherwise they will end up on your countertops, dining room table, desk or floor. An inbox of sorts works great. You can have a general family inbox or an inbox for each person. This is the most basic form of paper workflow. This inbox would be addressed frequently to avoid overflowing. You can take paperwork management to the next level by creating a paper workflow system. This system has an immediate action file for parents. Which is the location where papers requiring immediate action are placed. That way when your kid is shoving a field trip permission slip in your face, while you’re in the middle of making dinner or on a phone call, he will instead know where to put it for you to address it when you are ready. The paper workflow system also has a holding zone for each person. So each person can initially manage their own papers. This can hold homework that is due later in the week: notes from friends, invitations, artwork and completed homework. To manage the paperwork, let it pile up in the holding zone all week. As part of the workflow, establish a time each week that you and your family can go through the papers. During this time, you can review their work (artwork, graded homework, homework to be done, etc.) and decide what papers go to storage, need further attention or can be recycled. Your child may identify what papers they are ready to recycle after you see them. The papers that are going to storage, should be filed or stored soon after you go through the papers to prevent overwhelm. Papers for recycle go right to the recycle bin. Have a personal To-Do file for papers that need to be addressed or dealt with. Set aside time each week to work through the To-Do file. Create a file bin for each child. 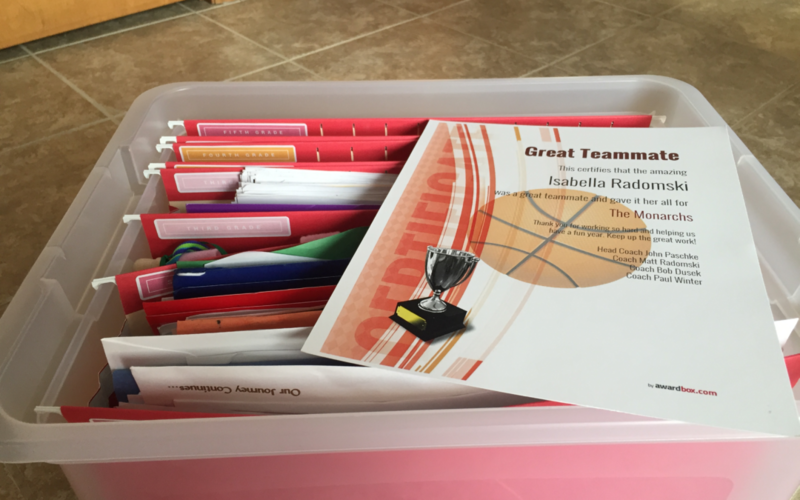 Have one folder (or two) for holding a nice representation of the work they completed each school year. Some great items to keep are: nice samples of their homework, quality art projects, certificates of participation, awards, and a few photos to represent their age. I like the clear plastic bins from Iris and legal size accordion file folders from Smead. The legal size folders allow for storage of artwork and projects that are a little larger than the standard 8 ½ x 11. 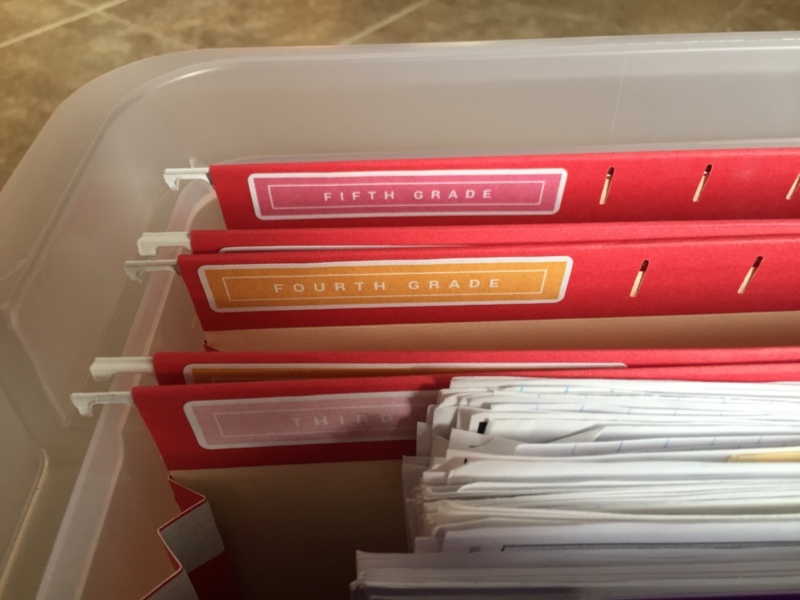 Avery file folder labels allow you to add a fun personal touch to the file bins. You can handwrite the labels or use your computer to create graphically designed labels. Iheartorganzing has some great pintables to make your file folders look great. Be sure to label each bin with the person’s name and age or grade. Digital storage is a great storage option for both children and adults. Digital storage is great for less physical papers when storage space is limited or not desired. By scanning your children’s work, you have the option of creating a custom photo or art book for their work. These books are great for kids that like to look back at their work and memories. Older kids can help create the books to add a personalized touch. Organizing kid’s papers is an ongoing job, but remember to keep it simple and have fun. Staying on top of their papers will reduce your stress, allow you keep what is meaningful, and address or recycle the rest. If you want help getting started on filing your children’s paperwork, an organizer can help. See if Top Shelf Home Organizing can help you on your journey. Contact Jayme to schedule a consult or chat about organizing. Organizing your library is fun when you select an organizing method that fits your personality and needs. There are two main methods for organizing books: by visual appeal and by topic. Which method you select will depend on a few things. Who accesses the books? Are you the only person who uses the books? Do you loan books to friends and family? Do your household members store and access the books as well? Are you a visual person or more of a systematic person? Consider these things when you determine how you want to organize your books. Organizing your books visually is a great way to organize your books if you recall your books by color and design of the spine. This is also a great method if you are looking to display your books versus reference your books. 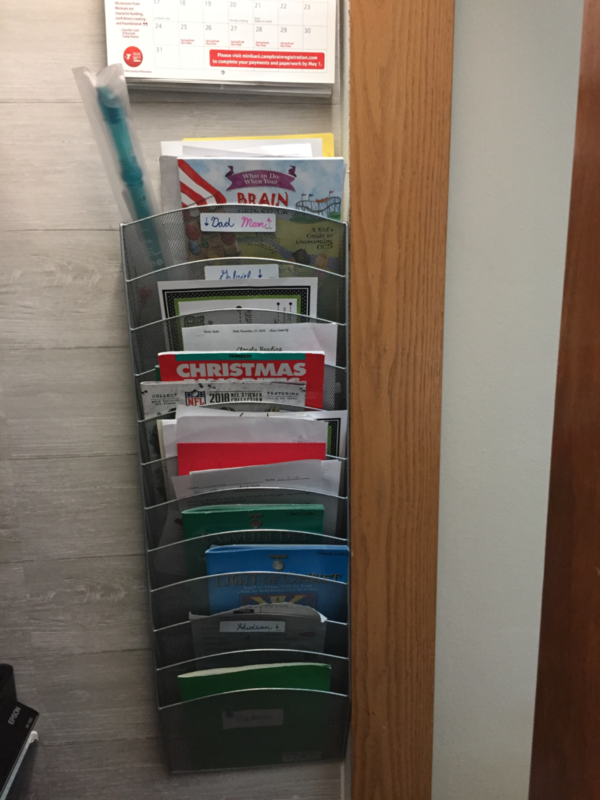 Visual organization includes organizing by color, size, orientation and cover type. You may choose to use a combination of visual methods in your library. Additionally, sorting books by hard cover versus paperback, and then by color, is an option for combining different visual strategies. You may select this method for its visual appeal and allowance for creativity. Creating a rainbow array or color block pattern may be your desire. 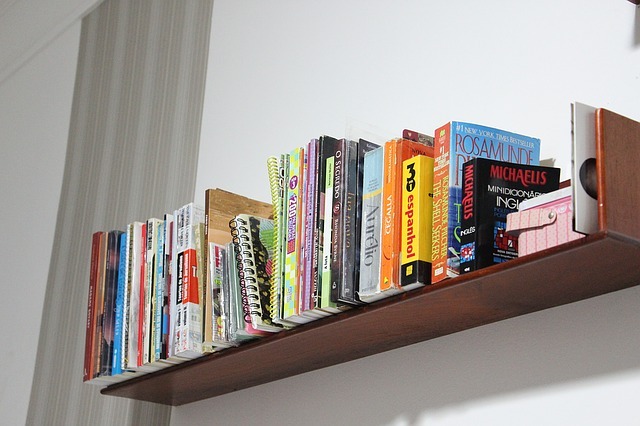 Aligning your books by height might create an interesting visual appeal for your collection. Organizing tall books with tall books and short books with short books will give your library a clean, structured look. Create visual interest when you arrange your books horizontally, vertically, or a combination of horizontal and vertical. Stacks of horizontal books can add a nice variety to your library and allow for select books to stand out from the rest. This is most practical for books that you don’t access regularly. Organizing your books by cover type is another visual method for organizing your books. Hard cover ‘heavier’ books on the bottom and paper back ‘lighter’ books toward the top of the shelf will give your library a nice structural look. This method is also great if you tend to recall your books by the spine design. Organizing your books by topic works well when you have multiple people in your home, and when you reference your books frequently. There are many, many ways to organize by topic. I have listed some ideas below. Think about what works best for you. Combining a couple methods may be required. For example, if you want to separate books by family member and then alphabetically. This method is great to separate out the books you have not read yet. When you are ready to start a new book, you know right where to go. This is perfect for the person who buys a lot of books or receives a lot of books as gifts. For the books you have already read, consider keeping only the ones you have loved and plan to read and reference again. Consider donating the books that you are done with. You may want to designate a special place to distinguish your favorite books. These are the books that have made a strong impact on you, and you want to display, share and admire. If you tend to reference your books by title or author, alphabetical arrangement may work best for you. This is a great method if you have a lot of books. It is easy to find and return books as you will know right where they go. If your library contains books that belong to many people, you may want to organize them by person. Place the kids books on a lower level of a shelf to make it easy for them to see, access and put away their books. If your husband still has all his college text books, those can go in his section. Each person can be responsible for their own books including how they are organized, which books they keep and which they donate. Arranging your books by subject or genre makes sense if you have a lot of books. This method is great when you tend to reference your books by subject. Subjects can include cookbooks, travel, history, professional resources, science fiction, educational, etc. Another simple method is to separate your books by fiction and non-fiction. You may desire to combine two or three methods, possibly both visual and topic methods. However, before you get started physically organizing your books, make a list of the types of books you own and how you like to use them. Remember to gather all the books in your home (basement, attic, office and bedrooms) so you can see the entire collection before sorting them into categories. Have fun organizing your books and remember to keep it simple. Donate the books you are done with that don’t bring you any joy. If you find organizing your books to be stressful, an organizer can help you complete your library organizing. See if Top Shelf Home Organizing can help you on your journey. Contact Jayme to schedule a consult or chat about organizing. This is the time of year to get your finances organized! That way you can have a plan for the year, and can get ready to prepare your tax returns. This is not an article on how to save money, or where the best place is to invest your fortunes. Before we can think about heading in those directions, we need to know where and what our current finances are. Here are some tips on getting your finances organized. Where is my Current Money? Jot down where all of your accounts are and their current balances. 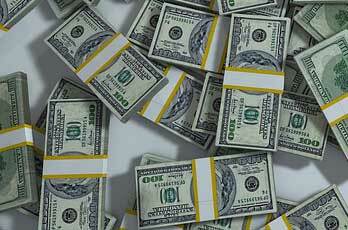 These accounts include savings, retirement, trusts, loans, credit cards, mortgages and medical debt. Share this information with your spouse or another responsible family member. Then if something happens to you, someone else knows where your finances stand. When tallying your income, remember to account for dependent care reimbursements, child support, social security, rental income and your income from your job. I like to think about my income after benefits and tax income (the income that is available to live on). This helps to put in prospective what I have to spend. Reflect on the last year or the last month. What where your expenses? Be honest. Then you can look forward to what expenses you will have in the coming year. Be honest. If medical expenses were $5,000 last year, will they be similar this year? Fixed –These are the monthly expenses that are probably not going to change. They may include housing, utilities, medical, food, tuition, etc. Philanthropy – This is the money you plan to give each month. This can include religious contributions, charitable giving, capital campaign commitments and pop up fundraisers (think neighbor kid raising money for the class trip to Washington DC, or the Scout selling wreaths). Future – This is where you plan for your and your family’s future. This may include retirement, savings, college savings, etc. Fun – This is the category that we all live for. This could include traveling, movies, sporting events, dinner out, golfing, gym memberships, a photography class, and so on. Consider using a cash only system or using one standard credit card for your purchases. This makes tracking your spending (and debt) simplified by having one platform to review your spending. Knowing where all your money is and where your money will go, will help you to get a grasp on getting your money organized. There are great apps available to assist you with budgeting and tracking where your money goes. Mint, Wally and NYAB are popular apps that are user friendly. Organizing your money will help you to make better decisions when unexpended expenses or fun opportunities are presented to you. An organizer can help you determine where your money is and detail where your money will go. See if Top Shelf Home Organizing can help you on your journey. Contact Jayme to schedule a consult or chat about organizing. Do you walk in the house after a long day at work and just sigh at your cluttered house? 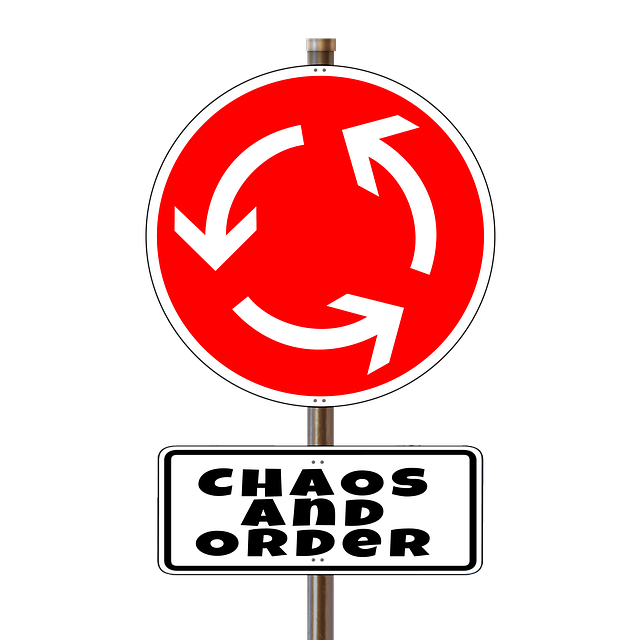 Have you planned to organize one morning but just did not know where to start or were just not in the mood? 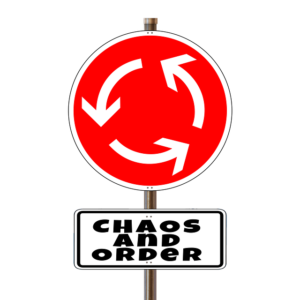 Are you caught in a vicious cycle: as soon as you organize one room another one has turned to chaos? Maybe you just need to prioritize, find motivation, and ask for help. Easier said than done? As with most goals in life, you want to strive for progress and improvement, not perfection. Most of us do not have time to achieve perfection in everything we do and still live a happy, fulfilling life. When you set goals, make them achievable, attainable. When you make that progress, create a visual way to track it or remind yourself of all you have accomplished. Since we will never have more than 24 hours in a day, we may have to say “no” to some activities and tasks. As you list each goal, task, or activity, ask yourself if it is necessary, if it supports your ultimate goals, or if any other activity or person will be negatively affected if it does not happen. You may see your list shrink before your very eyes. If you are not sure how to narrow your list, search the internet, ask a friend, or consult a professional organizer (we help with both the tangible and intangible). Do you start the day with the best of intentions to declutter the bathroom only to lose your drive because it is “just not worth it?” What is worth it to you? What do you value? Why? These questions may not seem to have much to do with organizing, but they can be the key to your motivation. How much time do you spend on activities that relate to your values? Most of us would probably answer “not enough.” Then why would you ever spend time on an activity not related to your values, such as organizing? The answer: organizing allows you to focus more on your values. Organizing means less time searching for the other shoe, fewer arguments over who last used the scissors and did not put them back, less time cleaning around the clutter. With less time wasted, you have more time to be with family, exercise, eat healthy, and pursue those life goals that really matter. The next time you wonder why you would ever make time to organize, remember that organizing can be a means to an end. If you find a task that seems pointless, ask yourself how that task can bring you closer to what means the most to you. It is amazing how a change in attitude and knowing what is in it for you can motivate. Even if most of your chores and daily tasks are “value added”, they are not always fun and often too much for one person. Solution: spread the responsibility among the whole household. What is boring to one person may be fun for another. One person’s weak spot may be another person’s strength. Some people have time in the morning to help everyone get ready for the day, and others have more time at night to help everyone get ready for bed. When you do ask for help, just remember to be specific or be prepared for the help to be not exactly what you expected. Letting others pick what they want and find their own way, within reason, may even make them more willing and productive. If organizing is overwhelming, a professional organizer can help. See if Top Shelf Home Organizing can help you on your journey. Contact Jayme to schedule a consult or chat about organizing.